In-depth critical discussion of (at most) three or four topics that are being explored in multiple contemporary information research projects. Topics vary from year to year, chosen not only in terms of importance, contemporary impact, and theoretical salience, but also so as to provide full representation of a diversity of methods, frameworks, literatures, and epistemic styles. 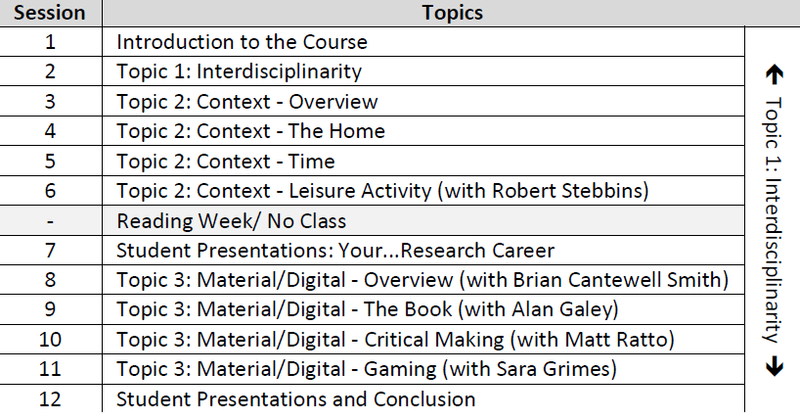 The three topics for Winter 2013 are interdisciplinarity, context, and the intersection of the material/digital. Interdisciplinarity is a theme that will infuse the entire semester. Context and and the intersection of the material/digital will be examined consecutively in units lasting four weeks each. Interdisciplinarity involves combining two or more academic disciplines into one activity; the objective is to create something new by crossing boundaries. Information studies has always been an interdisciplinary enterprise. In practice, institutions such as libraries and the internet were originally organized along disciplinary lines that are now increasingly muddied. In scholarship, information researchers draw upon ideas from any corner of the university. Today, most iSchool doctoral thesis are highly interdisciplinary in nature. Interdisciplinarity is the sole focus of Session 2 and thereafter is an underlying theme of the course. Guest speakers in Sessions 6, 8, 9, 10, and 11 exemplify interdisciplinary approaches. Readings, in-class discussion, and a diagramming exercise help students articulate their own interdisciplinary research agenda. Webster's dictionary defines context as "the interrelated conditions in which something exists or occurs." For most of the history of information studies, rational and scientific metatheoretical perspectives have not attended to the context surrounding information phenomena. A recent trend towards holism in information research has brought context to the fore, though the matter remains contested. Dervin calls context the "unruly beast" that has been construed variably across the social sciences and in information studies. Finnish theorists say context may be socio-economic conditions, work roles, tasks, problem situations, communities and organizations with their structures and cultures. In this climate, all doctoral thesis must account for context in some way. Our 4-week unit on context first explores landmark papers on the topic from information studies. The subsequent three weeks explore context as a physical environment (the home); a temporal force (time); and type of activity (leisure). Students will make progress in defining the context for information in their dissertation. Information studies concerns itself with information phenomena in material and digital forms. Seen simplistically: books, experts, libraries, and the hardware of information systems are prime examples of the former. Online communities, classification systems, information policy, and software are instances of the latter. As information and its enabling technologies rapidly evolve, the distinction between the material and digital blurs. Contemporary information researchers must address shifting formats and the complexities of this intersection. Our 4-week unit on this issue showcases iSchool Faculty whose research on information acknowledges both its material and digital properties. To start, philosopher of information Brian Cantwell Smith will introduce the topic. Subsequently, Alan Galey presents born-digital bibliography; Matt Ratto champions critical making; and Sara Grimes places material/digital in the realm of gaming. Upon conclusion, students gain an ability to locate their own research at this crossroads. The information horizon interview projects were created by students in the course INF1323, The Information Experience, at the University of Toronto's iSchool in the fall of 2017. The Information Horizons exhibition was curated by Ashley Nicol and Sara Stonehouse, under the supervision of Dr. Jenna Hartel.